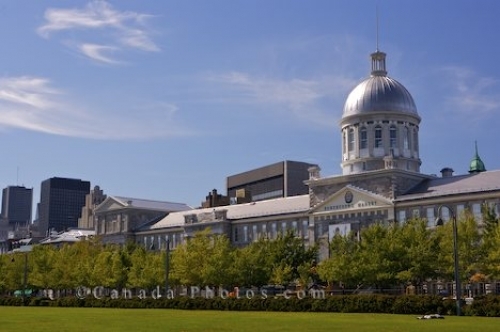 Centered in the downtown core of Montreal, Quebec, the beautiful architecture on the exterior of the Bonsecours Market sparkles in the sunlight. The Bonsecours Market is housed in a heritage building and is home to various restaurants, galleries, boutiques, market stalls and exhibits which attracts thousands of tourists yearly. The Bonsecours Market was inaugurated in 1847 and has been recognized as one of the 10 ten most beautiful heritage buildings throughout Canada. It is a two storey domed market open to the public and was designed by an architect named William Footner in 1844 but completed by George Browne in 1860. Picture of the exterior of the Bonsecours Market and the surrounding landscape in the downtown area of Montreal, Quebec. ... and creates many opportunities for stunning pictures. Bonsecours Market, Marche Bonsecours and downtown Montreal seen from the Bonsecours Basin, Montreal, Quebec, Canada.